So it's eventually here. I've been running the various betas for a little while now and as the final release is here I decided to install it. So after uninstalling the previous version (RC2 I think) the installer rebooted and once logged in came back with the "installing" dialog with nothing else at all on the screen - no taskbar, no desktop. Nada. Mmm. Helpful for a non-technical user. Never mind. I'll let it finish. Which it does. Eventually. Hurrah! 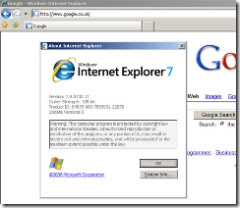 IE7! But not as it seems. 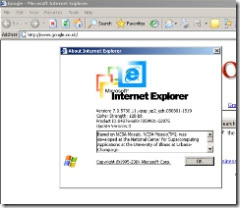 This looks a lot like IE6!?! Oops - not perhaps what was intended. It thinks it's IE7 but it certainly doesn't look like it. So before uninstalling and reinstalling I though I'd run the installer again. Hurrah! IE7! As it should be! So a bit of an interesting setup experience then. All appears to be working normally. And the Firefox IE Tab extension appears to be playing nicely with it.